Repeated blood transfusion in beta thalassemia major patients may lead to peroxidative tissue injury by secondary iron overload. In the present study, 100 patients(50 male+50 female) with beta thalassemia major patients with age (5-20) years and 60 healthy control were included during their attendance at Abin Al_Baladi hospital in Baghdad. Malondialdehyde ,Superoxide Dismutase and Vitamin E, were measured by using kits.The results showed A highly significant (p<0.01)increase in the levels of Malondialdehyde and Superoxide Dismutase, whereas, significant p(<0.01)decrease in the levels of vitamin-E, This suggest that oxidative stress and reduced antioxidant defense mechanism play an important role in pathogenesis of beta thalassemia major. أن تكرار نقل الدم في المرضى بيتا ثلاسيميا الكبرى يؤدي إلى إصابة الأنسجة نتيجه الحديد الزائد الثانوي. في هذه الدراسة،كان 100 عينه من المرضى (50 ذكور + 50 إناث) مع مرضى بيتا ثلاسيميا الكبرى في فئه العمريه (5-20) سنوات و 60 عينه من الاصحاء أثناء حضورهم في مستشفى أبن البلدي في بغداد.مالينديهايد,ودسميتوز وفيتامين(اي),وقياسها باستخدام الكتات وأضهرت النتائج زيادة كبيرة جدا في مستويات ماليندهايد ودستميوز(ع<0.01)في حين انخفاض في فيتامين (اي) ذا يشير إلى أن الاكسدة وانخفاض آلية الدفاع المضادة للأكسدة تلعب دورا هاما في التسبب في بيتا ثلاسيميا الكبرى. Leishmaniasis is a disease caused by a protozoan parasite of the genus Leishmania. It is transmitted by the bite of sandfly (Subfamily Phlebotominae). Limited drugs are available for the treatment of leishmaniasis, and the general drug (pentostam) have many side effect on patients. Therefore, there is an urgent need for another drugs for the treatment of leishmaniasis. This study aimed to develop new type of antileishmanial agents instead of classical drug (pentostam) and investigated the effectiveness of silver nanoparticles (Ag NPs) on Leishmania tropica parasites in both phases promastigote and amastigote in comparision to pentostam in in vitro condition. This study showed the effects of Ag NPs in comparision to pentostam with different concentrations (0.3, 0.6, 0.9, 1.2, 1.5, 1.8 and 2.1 µg/ ml) on L.tropica promastigotes viability. The viability of promastigotes after 72 hr. recorded maximum cytotoxic effect of Ag NPs in highest concentration (2.1 μg/ml), it was 23.17 ± 0.45 % comparing with pentostam which was 69.33 ± 0.33 %, as well as IC50 was calculated for MTT assay and the result for Ag NPs was 1. 749 µg/ml after 72 hr., while pentostam drug did not show IC50 in all treatments. On the other hand, the study also showed the effects of Ag NPs on L.tropica amastigote phase, and the viability was (3.10 ± 0.59 and 47.34 ± 0.87) % after 72 hr. in the highest concentration 2.1 μg/ml for Ag NPs and pentostam respectively, and IC50 was 1.148 µg/ ml for Ag NPs after 72 hr., but all results of pentostam stayed over than 50%. داء اللشمانيا هو مرض يسببه طفيلي من جنس اللشمانيا . ينتقل هذا المرض بواسطة لسعة حشرة ذبابة الرمل (من عائلة فليبوتومني). ان العقاقير المتوفره لعلاج هذا المرض محدوده والعقار العام هو البنتوستام والذي له العديد من الاثار الجانبيه على المريض. لذلك فان هناك حاجه ماسه لايجاد عقارات اخرى لعلاج هذا المرض. Leishmania tropica --- pentostam --- silver nanoparticles --- promastigotes --- amastigotes. Leishmaniasis is a worldwide disease still treated with expensive compounds that present severe side effects, and are frequently ineffective emphasizing the importance to search effective compounds against this disease. Miltefosine drug (HePC) that used as antitumor agent has been used against Leishmania tropica in two forms promastigote and axenic amastigote in vitro conditions. Different concentrations (5, 10, 15, 20, 25 and 30 µM) of HePC were performed and exposed to both parasite forms in comparison to sodium stibogluconate (Sb) drug. Parasites viability then was determined using MTT assay after 12, 24, and 48hr of exposure. DNA was extracted from treated and untreated parasites after 48hr of exposure and qualitative analysis of the total genomic DNA fragmentation was carried out through using agarose gel electrophoresis. The IC50 of HePC and Sb were 17.07 and 25.72 µM against L. tropica promastigotes, respectively, while, the IC50 of them were 18.08 and 21.29µM against axenic amastigotes respectively. Fragmented DNA in agarose gel electrophoresis was revealed in both parasite forms exposed to all used concentrations of HePC. These results showed the significant activity of miltefosine against the viability of L. tropica promastigotes and axenic amastigotes داء اللشمانيا من الامراض العالمية الانتشار التي لا زالت تعالج بمركبات باهضة الثمن ولها اعراض جانبيه خطيره واحيانا تكون غير فعاله مما يؤكد على ضرورة البحث عن مركبات فعاله ضد هذا المرض. عقار الملتيفوسين المستخدم كعامل مضاد للاورام تم استخدامه ضد اللشمانيا الاستوائيه بشكليها الامامي السوط وعديم السوط الخارجي في المختبر. حضرت تراكيز مختلفه من عقار الملتيفوسين ( 5, 10, 15, 20, 25, و 30 مايكرومولر) وتمت معاملتها مع كلا الشكلين للطفيلي بالمقارنه مع عقار البنتوستام. ثم تم قياس حيوية الطفيليات بأستخدام فحص الحيويه ( MTT ) بعد حوالي 12, 24 و 48 ساعه من التعريض. تم استخلاص دنا الطفيليات المعامله بالعقاقير بعد 48 ساعه من التعريض وأجري تحليل نوعي لتكسير جينوم الدنا الكلي من خلال ترحيله الكهربائي على هلام الاكاروز. لقد كانت الجرعه المثبطه لنصف عدد الطفيليات ( IC50 ) من عقاري الملتيفوسين والبنتوستام 17.07 و 25.72 مايكرومولر على التوالي ضد الطور الامامي السوط, بينما كانت قيمتها للطور اللاسوطي الخارجي 18.08 و 21.29 مايكرومولر على التوالي. لقد ظهر تكسير للدنا خلال ترحيله الكهربائي على هلام الاكاروز في كلا شكلي الطفيلي وبكافة التراكيز المستخدمه من عقار الملتيفوسين. أظهرت هذه النتائج فعاليه معنويه لعقار الملتيفوسين ضد حيوية الطور امامي السوط وعديم السوط الخارجي من اللشمانيا الاستوائيه. 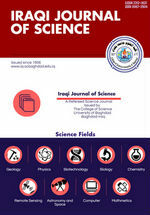 This study was carried out in the laboratories of fish and animal resource center-Agricultural Research Directorate for the period between 1/3-26/5/2015 to study the effect of total and partial substitution of white corn (WC) Sorghum bicolor germinated for different period and additive mixture of probiotic & diet enzymes of yellow corn (YC) Zea mays in common carp Cyprinus carpio L. diets. The fish fed on experimental diets contained two levels of substitution germination WC with three different periods and not germination with 0.5% mixture of probiotic+diet enzymes (50% and 100%) from YC. A 11 experimental diets were formulated, diets 1 and 2 used raw WC without germinate at two substitution levels of 50% and 100% respectively of YC, diets 3 and 4 use WC germinates for 24 hour at two substitution levels of 50% and 100% respectively of YC, diets 5 and 6 use WC germinates for 48 hour at two substitution levels of 50% and 100% respectively of YC, diets 7 and 8 use WC germinates for 72 hour at two substitution levels of 50% and 100% respectively of YC, diet 9 and 10 use WC without germinates add (0.5% mixture of probiotic + diet enzymes) at two substitution levels of 50% and 100% respectively of YC and diet 11 (control without white corn). The results of statistical analysis showed that a benefit of using diets which containing white corn which germinated for 48h (T5 and T6) and the diets which add 0.5% mixer of probiotic + diet enzymes (T9 and T10) for all parameters at substitution 50% and 100%. أجريت التجربة في مختبرات مركز الثروة الحيوانية والسمكية–دائرة البحوث الزراعية للفترة من 1/3-26/5/2015 لدراسة تأثير الإحلال الجزئي والكلي للذرة البيضاء Sorghum bicolor المنبتة بثلاث فترات مختلفة مع إضافة مزيج (المعزز الحيوي+الأنزيمات العلفية) بدل الذرة الصفراء Zea mays في علائق أسماك الكارب الشائع .Cyprinus carpio L. غذيت الأسماك على علائق مختبرية تحوي مستوين أحلال الذرة البيضاء (50% و100%) المنبتة بثلاث فترات وبدون أنبات مع إضافة 0.5% من مزيج المعزز الحيوي+الإنزيمات العلفية بالذرة الصفراء. صنعت 11 عليقة مختبرية، العليقة الأولى والثانية أضيفت الذرة البيضاء الخام بدون أنبات بمستوين إحلال 50% و 100% على التتالي عن الذرة الصفراء، العليقتان الثالثة والرابعة أضيفت الذرة البيضاء المنبتة 24 ساعة وبنفس مستوى الإحلال، العليقتان الخامسة والسادسة أضيفت الذرة البيضاء المنبتة 48 ساعة وبنفس مستوى الإحلال، العليقتان السابعة والثامنة أضيفت الذرة البيضاء المنبتة 72 ساعة وبنفس مستوى الإحلال، العليقتان التاسعة والعاشرة أضيفت الذرة البيضاء الخام بدون أنبات مع إضافة 0.5% مزيج (المعزز الحيوي+الإنزيمات العلفية) وبنفس مستوى الإحلال والعليقة الحادي عشرة للمقارنة بدون ذرة بيضاء. أظهرت النتائج الإحصائية أفضلية العلائق الحاوية على الذرة البيضاء المنبتة 48 ساعة (T5 وT6) والعلائق المضاف إليها 0.5% مزيج المعزز الحيوي+الإنزيمات العلفية (T9 وT10) لجميع المعايير المدروسة وبمستوين الإحلال 50% و 100%. Isolation and identification of bacterial isolates were carried out according to the morphology and biochemical characteristics on one hundred and twenty stool specimens collected from children under five years old via using biochemical tests and Api 20E compact system for further confirmation. Bacterial isolates were distributed as (34.48, 20.68, 5.17,0.86) % for Escherichia coli, Salmonella typhi ,Enterobacter aerogenos, Citrobacter freundii and Hafnia alvei respectively and 9.48 % for each Proteus mirabilis, Pseudomonas aeruginosa and Klebsiella Pneumonia. As well as, 2.58% for both Shigella sonnei and Serratia marcescens. Antibiotic susceptibility test for 116 bacterial isolates was performed towards 20 antibiotics types using disk diffusion method. The results showed dissimilar resistance values towards different antibiotics, ten bacterial isolates were collected for each bacterial species to study their resistance values, the ones with the highest resistance level were selected for further study. Meanwhile, easy and cheap green method using the banana peel extract (BPE) was applied to synthesize silver nanoparticles (AgNPs). Phytochemicals of BPE were screened by standard methods. The results verified the existence of alkaloids, flavonoids, and glycosides in it. These components were act as a reducing agent ,stabilizing and capping agents for AgNO3 with the assistance of the microwave. The successfully preparation of AgNPs was established by ultraviolet-visible spectroscopy, Transmission electron microscopy (TEM), Dynamic light scattering (DLS), Fourier Transform Infrared Spectroscopy (FTIR) and zeta potential analysis. The antibacterial activity of the AgNPs against multidrug resistance (MDR) bacteria were studied by using disk diffusion method. The results showed a considerable effect against MDR isolates. The synergistic effects of biosynthesis AgNPs at different concentrations with different standard antibiotic discs (which were Tobramycin, Chloramphenicol, Nitrofuration, Ampicillin-clavulanic acid and Nalidixic acid) against MDR bacteria were also investigated. The result showed the synergistic action of AgNPs and antibiotics leading to enhance antibacterial activity. جمعت مئة وعشرين عينه براز من الاطفال بعمر اقل من خمس سنوات. وقد تم عزل وتشخيص هذه العزلات البكتيرية بالاعتماد على الشكل الظاهري والاختبارات الكيموحيويه والتشخيص التأكيدي بأستخدام نظام الcompact system20 Api.وزعت العزلات البكتيرية بنسبة(٤٨. ٣٤, ٦٨. ٢٠ ,١٧.٥, ٨٦. ٠)لكل من Hafnia alvei,Enterobacter aerogenos,Citrobacter freundii,Salmonella yphi, Eshreichia coli %9.48لكل من Pseudomonas aeruginosa, Klebsiella Pneumonia وايضا %2.58 لكل من Shigella sonnei , Serratia marcescens اجري اختبار فحص الحساسية للمضادات, 116 عزلة بكتيرية تجاه 20 نوع مضاد باستعمال طريقة الاقراص.اظهرت النتائج وجود تغاير في مستوى المقاومة تجاه المضادات البكتيرية المختلفة.لقد تم اختيار عزلة بكتيرية واحده من كل نوع بكتيري ذات مقاومة عالية من عشر عزلات للتجارب اللاحقة.من جانب اخر فقد تم تصنيع دقائق الفضة بنجاح باستعمال قشور الموز بواسطة الطريقة الخضراء السهلة والرخيصة. كذلك وقد تم فحص المواد الكيميائية النباتية lphotochemica لقشور الموز بالطريقة القياسية اظهرت النتائج وجود القلويدات, والفلافونيد, والكلايكوسيدات بمساعدة المايكروويف كعوامل اختزال واستقرار وتغطية لنترات الفضة تم تأكيد بناء دقائق الفضة النانوية بواسطة ultraviolet-visible spectroscopy , Transmission electron microscopy Fourier Transform Infrared Spectroscopy (FTIR) , Dynamic light تم اختبار الفعالية ضد البكترية لدقائق الفضه النانوية ضدzeta potential و Scattering البكتريا متعددة المقاومة للمضادات الحيوية باستخدام طريقة نشر الاقراص اذ ظهرت النتائج تأثير جيد ضد العزلات متعددة المقاومة للعقار.وكذلك فقد اختبر التأثير التأزري لدقائق الفضة بتراكيز مختلفة مع انواع مختلفة من اقراص المضادات (التي كانت Nalidixic acid, Ampicillin-clavulanic acid, Chloramphenicol, Nitrofuration ,Tobramycin) ضد البكتريا متعددة المقاومة المضادات الحيوية . لقد اظهرت النتائج بأن التأثير التأزري لكل من دقائق الفضة واقراص المضادات الحيوية ادى الى تعزيز الفعالية المضادة للبكتريا . Silver nanoparticles --- Phytochemicals --- Antibacterial --- Biosynthesis --- Synergistic effects. In this work, the photoluminescence spectra (PL) of porous silicon (PS) have been modified by adding gold nanoparticles (AuNPs) to PS layer. PS was produced via Photo electro-chemical etching (PECE) method of n-type Si wafer with resistivity of about (10 Ω.cm) and (100) orientation. Laser wavelength of (630 nm) and illumination intensity of about (30 mW/cm2), etching current density of (10mA/cm2), and etching time of (4 min) were used during the etching process. The bare PS before metallic deposition process and porous silicon/gold nanoparticles (PS/AuNPs) structures were investigated by X-Ray Diffraction (XRD), scanning electron microscopy (SEM), and energy dispersive X-Ray (EDX). The photoluminescence spectra were investigated as a function of gold nanoparticles sizes and distribution on the surface of PS. It was found that there are two behaviours were observed for the photoluminescence spectra of PS/AuNPs substrate; quenching and enhancement effects based on the average gold nanoparticles sizes and their aggregation forms. Keywords: PS/AuNPs, PECE process, HF acid, Photoluminescence spectra, gold nanoparticles, metallic solution concentration. في هذا البحث تم تحسين طيف التلؤلؤ الضوئي للسليكون المسامي عن طريق اضافة جسيمات الذهب النانوية الى طبقة السليكون المسامي.السليكون المسامي تم تحضيره بطريقة التنميش الضوء كهروكيميائية لشريحة السليكون من النوع المانح ذات مقاومية(10) اوم.سم وتوجه (100). الليزر ذو الطول الموجي(630) نانومتر بشدة اضاءة (30) ملي واط سم2 , وكثافة تيار التنميش (10) ملي امبير سم2 , وزمن تنميش (4) دقائق تم استخدامها خلال عملية التنميش. تراكيب السليكون المسامي المجرد)قبل عملية الترسيب المعدني) والسليكون المسامي المطعم بجسيمات الذهب النانوية تم دراستها بواسطة قياس حيود الاشعة السينية,المجهرالماسح الالكتروني,وقياس تشتت طاقة الاشعة السينية. طيف اللمعان الضوئي تم دراسته كدالة لحجم جسيمات الذهب النانوية وتوزيعها على سطح السليكون المسامي.لقد وجد ان هناك سلوكين تم ملاحظتهما بالنسبة لطيف اللمعان الضوئي لتركيب السليكون المسامي المطعم بجسيمات الذهب النانوية: هما ظاهرتي الاخماد والتعزيز بناء على معدل حجم جسيمات الذهب النانوية واشكال تكتلاتها. We have studied the synthesis environment of ambient pressure silica aerogels influence on their resulting morphological and optical properties. Transparent nanoporous silica aerogel was synthesized at ambient pressure using tetraethylorthosilicate precursor via a sol-gel process. Effect of drying control chemical additives and catalyst on physical properties was investigated. Trimethylchlorolsilane was employed as a hydrophobic reagent in the surface modification process. All aerogel samples were prepared utilizing a subcritical procedure under reactant pH fixed at 8.3, using just ammonium hydroxide or together with ammonium fluoride as catalyst. The effects catalyst types as well as drying control chemical additives on the physical properties of the nanoporous silica aerogels (particle size, surface area, percentage of shrinkage, contact angle, and density) were investigated. تم دراسة تأثير وسط التحضير لمادة الايروجل المحضرة تحت الضغط الجوي .على الخواص التشكيلية والبصرية ،تم تحضير السيليكا ايروجل ذات المسامات النانويه تحت الضغط الجوي باستخدام البادره تترااثيل اورثوسيليكات وبطريقة السول جل . تم التحقق من تأثير الإضافات الكيمائية والعوامل المساعدة على الخواص الفيزيائية ،وقد استخدُم تيرااثيل كلوروسيلان كجذر طارد للماء في عملية تحسين السطح . جميع عينات الايروجل حُضرت باستخدام إجراءات تحت الحرجة وبثبوت مقياس الحامضيه (PH) على 8.3 وباستخدام هيدروكسيد الامونيوم فقط تارة ومع فلوريد الامونيوم تارة أخرى كعوامل مساعده. ان تاثيرات نوع العوامل المساعدة والإضافات الكيميائية على الخواص الفيزيائية للايروجل ذات المسامات النانوية (حجم الجسيمات, المساحة السطحية, النسبه المئويه للانكماش , زاوية الالتصاق, والكثافة) تم التحقق منها. Silica aerogels --- Hydrophobic --- Silylating Agent --- Contact angle --- Ambient Pressure. Skyrme–Hartree–Fock (SHF) method --- Elastic electron scattering. Enhance the delineation of masked structures in southern Iraq by applying the Biharmonic operator to their gravity field. The gravity field of southern Iraq shows steep gradient of regional trend. The gravity contours over the anticline structures in this area do not show the closure characteristic of these structures. The effect of lateral density variation for Hormuz Salt complicates the case in the area. Higher derivatives are one of the means that have been used to remove the effect of such regional gravity variations, which can easily mask significant structures. Biharmonic Operator is used to delineate these distort structures, follow their extent and at the same time distinguish new features. The Biharmonic operator manipulation has ability to suppress the effect of regional and enhance the local anomalies. The problem with higher derivatives operation is that, it enhance dramatically high frequency components of gravity field, but with smoothing the result is remarkable. A synthetic model is used to support the idea, and then the operation is applied to the gravity field of southern Iraq. Many new features are deduced and new extents of the old known ones are determined. يظهر المجال الجذبي لمنطقة جنوب العراق مجال اقليميا ذا انحدار شديد. خطوط الكنتور الجذبية فوق تراكيب الطيات لا تظهر صفات انغلاق فوق التراكيب وتأثير التباين الكثافي الجانبي لملح الهرمز يزيد الحالة تعقيدا. استخدام المشتقات العليا يمكن ان تكون احد الوسائل لازالة تأثير التغيرات الجذبية الاقليمية التي تخفي التراكيب المهمة بسهولة. استخدم معالج التوافقية المزدوجة لتحديد التراكيب المشوهة وايجاد امتدادتها وفي نفس الوقت تحديد تراكيب جديدة. لمعالج التوافقية المزدوجة القدرة على قمع تأثير المجال الاقليمي وفي نفس الوقت ابراز التراكيب الضحلة. المشكلة في معالجات المشتقات العليا في انها تحسن بشكل كبير مركبات الترددات العالية في المجال الجذبي, ولكن مع عملية تنعيم تكون النتائج ملفتة للانتباه. استخدمت موديلات مصنعة لدعم الفكرة, بعدها تم تطبيق المعالج على المجال الجذبي لجنوب العراق. تم الاستدلال على العديد من التراكيب الجديدة وتم تحديد امتداد جديد للتراكيب السابقة. Biharmonic Operator --- Enhance masked structures --- Gravity field of Iraq. The granitoid bodies in the Shalair Valley are structurally located within so-called Iraqi Zagros Suture Zone, in the northeastern Iraq. One hundred and sixty-two representative samples were collected from five granitoid intrusive bodies in the valley: Aulan and Siristan in the northern part, Mishao and Laladar in the southern part and Demamna in the western part. Two major types of granitoids in the eastern and western part of the Shalair Valley area were indentified. The granitoids from the four locations in the eastern part, have similar mineral constitutes. These rocks are composed of plagioclase + quartz ± hornblende with two types of texture, equigranular texture represented by Aulan and Siristan in the northern part and porphyritic texture in the southern part represented by Mishao and Laladar. This reflects several stages of intrusive events, starting with stable fractional crystallization conditions represented by Aulan and Siristan granitic rocks with equigranular texture and a late stage of unstable crystallization conditions represented by Mishao and Laladar granitic rocks with porphyritic texture. Damamna granites in the western part have different mineral composition. They are composed of K-feldspar, quartz and small amount of plagioclase with graphic texture represented by the intergrowth between K-feldspar and quartz, which reflects simultaneous crystallization of K-feldspar and quartz from a silicate melt close to the eutectic point. تركيبيا تقع الاجسام الكرانيتويدية في وادي شلير ضمن نطاق الالتحام لسلسلة زاكروس العراق في الجزء الشمالي الشرقي العراقي و يعتبر وادي شلير جزء من نطاق سننداج-سرجان في ايران. تم جمع مائة وأثنتان وستين عينة ممثلة للاجسام الكرانيتويدية الخمسة في منطقة الدراسة: اولان و سيرستان في الجزء الشمالي, مشاو و لالادار في الجزء الجنوبي ودمامنا في الجزء الغربي. بينت الدراسة البتروغرافية للصخور قيد التدريس انه هنالك نوعان من الصخور الكرانيتويدية. في الجزء الشرقي والجزء الغربي ضمن وادي شلير.الصخور الواقعة ضمن الجزء الشرقي والمثمثلة : اولان, سيريستان, مشاو ولالادار لها تركيب معدني متشابة (بلاجيوكليز + كوارتز ± هونبلند) مع وجود نوعين من النسيج . النسيج المتساوي الحبيبات والممثل بصخور اولان وسيرستان في الجزء الشمالي والنسيج البورفيري والمتمثل بصخور مشاو ولالادار. هذه الصفات ممكن ان تعبر عن وجود عدة مراحل من الاقحام والتي تبدء بظروف تبلور مستقرة التي كونت النسيج المتساوي الحبيبات والمثمثلة بأجسام اولان, سيريستان, وظروف تبلور غير مستقرة والمتمثلة بتكون النسيج البورفيري ضمن اجسام مشاو ولالادار. ان صخور كرانيت دمامنا في الجزء الغربي لمنطقة الدراسة لها تركيب معدني مختلف عن الصخور الواقعة في الجزء الشرقي. تتكون هذه الصخور من الاورثوكليز وكوارتز وكميات قليلة من البلاجيوكليز , مع تواجد النسيج الكرافي والذي يمثل النمو المتداخل بين الاورثوكليز والكوارتز, والذي يعكس توافق تبلور الاورثوكليز والكوارتز من الصهير السليكي قريبا من النقطة الحرجةالانصهارية. Five oil sample of Mashrif and Nahr Umr Formation for Amarah oil field, southern Iraq, were taken and analyzed in Geo Mark laboratory in USA center in order to determine the bulk properties of crude oils and carbon isotopes for these samples in addition to determine biomarker parameters using Gas Chromatography(GC), and Gas Chromatography Mass Spectrometry) GCMS (analytical technique. According to these biomarker analyses of the two formation, it is indicated that they are non-degraded, marine, non-waxy, derived from carbonate source and deposition in anoxic marine environment. This study also showed that the bulk properties (terpanes and steranes) of Amarah oil field are one family, and the source rocks contain marine kerogen type II. All oil samples of Amarah oil field are from source rock refer to Middle Jurassic age of sargelu Formation. تم اخذ خمسة نماذج نفطية لتكوين المشرف ونهر عمر من حقل نفط العمارة، جنوب العراق وتم تحليلها في مختبر (Geo Mark) في مركز الولايات المتحدة الامريكية من اجل تحديد خصائص المواد النفطية السائبة ونظائر الكاربون لهذه النماذج بالإضافة الى تحديد معايير العلامات البيولوجية باستخدام تقنيه (كروماتوغرافيا الغاز)، وتقنيه (كروماتوغرافيا الغاز- طيف الكتله). ووفقا لتحاليل العلامات البيولوجية للتكوينين فقد تبين انها غير متكتلة وبحرية وغير شمعية متكونة من صخور مصدرية كاربونية ومترسبة في بيئة بحرية غير مؤكسدة. كما اشارت هذه الدراسة الى ان الخصائص السائبة في حقل نفط العمارة تعود الى عائلة واحدة، وان الصخور المصدرية تحوي نوع الكيروجين البحري الثاني. كما ان جميع العينات النفطية هي من الصخور المصدريه التي تعود الى العصر الجوراسي لتكوين الساركلو. Concentration of NORM then radiological hazard indices were investigated and assessed in different stages of oil and gas production industry that belongs to East Baghdad Oil Field. Sixteen samples of different types of materials were collected representing oil and gas production from first stage to final stage. The samples are prepared then sent to Radiation Protection Center (RPC) / Ministry of Environment for radioactivity analysis using gamma ray spectrometry system based on HPGe. The results show that max value of Ra-226 is 252.4 Bq/kg in sediment sample collected from the final stage of water treatment before it is transferred to disposal well and min value is 1.2 Bq/kg in formation water. The max. activity of Th-232 is 79.4Bq/kg also in sediment sample and the min value 2.9 Bq/Kg in crude oil in storage tank while, the max. value for K-40 is 529.6 Bq/Kg in burning stage (burn pit) and the min value is 2.8Bq/kg in Pre-treatment crude oil. The ambient exposure dose values near the sampling locations were recorded using dosimeter type GMC-300. The results are corresponding with the values of NORMs in the locations. The ambient gamma rates in the study area range between (0.04-0.22) µSv/h corresponding to (57-314 nGray/h). Most locations have values above the average worldwide value of (58 nGray/h). NORMs are caused absorbed dose in max. contribution (79%) to the total ambient gamma dose. Radium caused the max. contribution among the others. All the hazard indices indicate that most of the sampling locations have indices acceptable and with no hazard.جرى قياس تراكيز النويدات المشعة المتواجدة طبيعيا ومعاملات المخاطر الاشعاعية لموقع مصنع انتاج النفط والغاز التابع لحقل شرق بغداد. تم اختيار نماذج مختلفة تمثل مراحل انتاج النفط والغاز في موقع المصنع وحٌضَرت النماذج وقيس النشاط الاشعاعي بمختبرات مركز الوقاية من الاشعاع/وزارة البيئة باستخدام منظومة تحليل اطياف كاما المستندة الى عداد الجرمانيوم عالي النقاوة. بينت النتائج ان اعلى قيم لنشاط الراديوم-226 كانت 252.4 بكريل/كغم في نموذج الرواسب من المرحلة النهائية من عملية معالجة المياه وفصل النفط قبل انتقاله الى ابار التصريف بينما اقل قيمة للراديوم تم قياسها في نموذج المياه المكمنية(1.2 بكريل/كغم) . بينما تراوحت تراكيز الثوربوم-232 والبوتاسيوم- 40 بين (2.9-79.4) بكريل/كغم و(2.8 -529.6) بكريل /كغم على التوالي. تتراوح جرع التعرض كاما المحيطية في منطقة الدراسة بين(0.04-0.22)مايكروسيفرت/ساعة والتي تعادل (57-314)نانوكراي/ساعة. كانت معظم مواقع النمذجة ذات جرع اشعاعية تقترب او اعلى من معدل الجرع العالمية(58 نانوكراي/ساعة). كانت مساهمة النويدات المشعة المتواجدة طبيعيا في اعلى قيمها تمثل(79%) من الجرعة المحيطية الكلية وكانت مساهمة الراديوم هي الاكبر من بين النويدات الاخرى. بينت معاملات المخاطر الاشعاعية ان معظم المواقع ذات قيم معاملات مقبولة ولا تشكل مخاطر اشعاعية. In this paper, we introduce and study new types of soft open sets and soft closed sets in soft bitopological spaces , namely, (1,2)*-maximal soft open sets, (1,2)*-maximal soft (1,2)*-pre-open sets, semi (1,2)*-maximal soft (1,2)*-pre-open sets, (1,2)*-maximal soft closed sets, (1,2)*-maximal soft (1,2)*-pre-closed sets, (1,2)*-minimal soft open sets, (1,2)*-minimal soft (1,2)*-pre-open sets, (1,2)*-minimal soft closed sets, (1,2)*-minimal soft (1,2)*-pre-closed sets, and semi (1,2)*-minimal soft (1,2)*-pre-closed sets. Also, properties and the relation among these concepts have been studied. Keywords: (1,2)*-maximal soft (1,2)*-pre-open set, (1,2)*-minimal soft (1,2)*-pre-open sets, (1,2)*-maximal soft (1,2)*-pre-closed sets, (1,2)*-minimal soft (1,2)*-pre-closed sets, semi (1,2)*-maximal soft (1,2)*-pre-open sets, semi (1,2)*-minimal soft (1,2)*-pre-closed set. في هذا البحث نحن قدمنا ودرسنا انواع جديدة من المجموعات المفتوحة الميسرة والمجموعات المغلقة الميسرة في الفضاءات التبولوجية الثنائية الميسرة أسميناها بالمجموعات المفتوحة الميسرة الاكبرية (1,2)*- , المجموعات المفتوحة pre- (1,2)*- الميسرة الاكبرية (1,2)*- , المجموعات المفتوحة pre- (1,2)*- الميسرة شبة الاكبرية (1,2)*- , المجموعات المغلقة الميسرة الاكبرية (1,2)*-, المجموعات المغلقة- (1,2)*- pre الميسرة الاكبرية (1,2)*-, المجموعات المفتوحة الميسرة الاصغرية (1,2)*- المجموعات المفتوحة pre- (1,2)*- الميسرة الاصغرية (1,2)*-, المجموعات المغلقة الميسرة الاصغرية (1,2)*- , المجموعات المغلقة pre- (1,2)*- الميسرة الاصغرية (1,2)*-, المجموعات المغلقة pre- (1,2)*- الميسرة شبة الاصغرية (1,2)*-. كذلك درسنا العلاقة بين هذة المفاهيم و خصائصهم. The multicast technology implements a very high-efficiency point-to-multipoint data transmission over IP networks (IPv4 and IPv6). Multicast reduces network load, eliminates traffic redundancy, and saves network bandwidth. Therefore, multicast used widely in LAN/WAN applications such as online games, video conferencing and IPTV. The multicast technology implements varied protocols such as DVMRP(Distance Vector Multicast Routing Protocol), MOSPF(Multicast Open Shortest Path First), or PIM-DM (Protocol Independent Multicast- Dense Mode) which considered source tree type, while PIM-SM (Protocol Independent Multicast- Sparse Mode) and CBT (Core Based Tree) uses shared tree. Current paper focuses on the performance evaluation of the two multicast protocols: PIM-SMv4 and PIM-SMv6 based on QoS metrics like throughput, jitter, datagram loss and Data received. PIM-SM over IPv6 showed good results compared with PIM-SM over IPv4 by 1.04%, 0.64%, 32.56% and 89.84% in terms of data received, throughput, jitter and datagram loss respectively .GNS3 simulator/emulator and JPERF used to evaluate this performanceتقنيه الارسال المتعدد تقوم بتفيذ ارسال البيانات من نقطة الى عده نقاط عبر بروتوكول الانترنت (IPv4/IPv6) بكفاءه عاليه. تقنيه الارسال المتعدد تقلل الحمل على الشبكه ، ويزيل حركه المرور المتكرره و تحافظ على عرض النطاق الترددي للشبكة. لذلك الارسال المتعدد يستخدم بشكل واسع في تطبيقات LAN/WAN مثل الالعاب عبر الانترنت، مؤتمرات الفديو و البث التلفزيوني عبر الانترنت. يتم تنفيذ الارسال المتعدد عبر عدد متنوع من البروتوكولات مثل DVMRP وMOSPF اوPIM-DM التي تستخدم شجره المصدر، بينما PIM-SM و CBT التي تستخدم الشجره المشتركه . يركز هذا البحث على تقيم الاداء نوعين من انواع بروتوكولات الارسال المتعدد: PIM-SMv4 and PIM-SMv6 بالاعتماد على مقاييس جوده الخدمه مثل الانتاجيه ، jitter، فقدان حزمه البيانات والبيانات المستلمه . اضهر بروتوكول PIM-SM عبر الجيل السادس من بروتوكول الانترنت نتائج افضل منه عبر الجيل الرابع من بروتوكول الانترنت بنسبه 1.04%, 0.64%, 32.56% و 89.84% فيما يتعلق ب البيانات المستلمه ،الانتاجيه ، jitter، وفقدان حزمه البيانات على التوالي. استخدم برنامج محاكي الشبكه GNS3 لتقيم هذا الاداء. Segmentation of real world images considered as one of the most challenging tasks in the computer vision field due to several issues that associated with this kind of images such as high interference between object foreground and background, complicated objects and the pixels intensities of the object and background are almost similar in some cases. This research has introduced a modified adaptive segmentation process with image contrast stretching namely Gamma Stretching to improve the segmentation problem. The iterative segmentation process based on the proposed criteria has given the flexibility to the segmentation process in finding the suitable region of interest. As well as, the using of Gamma stretching will help in separating the pixels of the objects and background through making the dark intensity pixels darker and the light intensity pixels lighter. The first 20 classes of Caltech 101 dataset have been utilized to demonstrate the performance of the proposed segmentation approach. Also, the Saliency Cut method has been adopted as a benchmark segmentation method. In summary, the proposed method improved some of the segmentation problems and outperforms the current segmentation method namely Saliency Cut method with segmentation accuracy 77.368%, as well as it can be used as a very useful step in improving the performance of visual object categorization system because the region of interest is mostly available. تجزئة صور العالم الحقيقي تعتبر واحدة من أكثر المهام تحديا في مجال الرؤية الحاسوبية بسبب العديد من المشاكل التي ترتبط مع هذا النوع من الصور مثل التداخل العالي بين المقدمة والخلفية للكائن البصري وكائنات بصرية معقدة وكثافة حافة البكسل في الكائن والخلفية تتشابه تقريبا في بعض الحالات. وقد قدم هذا البحث عملية تجزئة معدله ومتكيفة بالاعتماد على تمدد تباين الصور وهي “Gamma Stretching” لتحسين مشكلة التجزئة. إن عملية التجزئة المتكررة على أساس المعايير المقترحة اعطت مرونة عالية لعملية التجزئة في العثور على الكائن في الصورة. وكذلك، فإن استخدام “Gamma Stretching” سيساعد في فصل بكسل الذي ينتمي للكائن من البكسل الذي ينتمي للخلفية من خلال جعل البكسل المظلم أكثر قتامة والبكسل المضيء اكثر اضائة. وقد استخدمت اول عشرين صنف من قاعدة بينات “Caltech 101” للتدليل على فعالية أداء طريقة التجزئة المقترحة.أيضا، وقد استخدمت طريقة Saliency” “Cut كمعيار لقياس كفائة الطريقة المقترحة.وباختصار، فان الطريقة المقترحة عالجت بعض مشاكل التجزئة وتفوقت على طريقة التقطيع الحالي وهي طريقة ال “Saliency Cut” بدقة تقسيم 77.368٪ وبالاضافه الى ذلك يمكن استخدام طريقة التجزئه كخطوة اساسيه في تحسين أداء تميز الكائن البصري لأن المنطقة ذات الاهتمام تتوفر في الغالب. In this work, it have earthquakes data been analytized as a result of ground water injection attendant to dig wells and oil, which affects the pressure pores in the rock and is according to cause a medium-sized earthquake that have already occurred more than 20 times. according to the publication of the Department of Attenba, the dangers of earthquakes and movement flooring in Guy-Greenbrie-United area of one of United States of America cities, where these data represent a monitor magnitudes of earthquakes from September 2008 the September 2011, we conducted statistical analysis and create a model for earthquakes flooring that was chosen for four distributions and results i the optima reveal the best distribution is the Burr X11 then General Extreme value, and lognormal distribution, and normal distribution. We applied the maximum likelihood method for estimating the parameters of these distribution. في هذا العمل تم تحليل بيانات الزلازل الأرضية متوسطة الشدة نتيجة حقن الارض بالمياه المصاحبة لحفر الابار النفطية والتي يؤثر على الضغط المسام في الصخور ويحتمل ان تتسبب في حدوث الزلازل متوسطة الحجم التي حدثت بالفعل لا كثر من 20مره حسب ما نشر من دائرة التنبؤ واخطار بالزلازل و الحركة الأرضية في منطقةGuy-Greenbrier-United لا حدى المدن الولايات المتحدة الأمريكية حيث تمثل هذه البيانات رصد مقادير الزلازل في ايلول 2008الى ايلول 2011 , اجرينا تحليلا احصائيا ولإيجاد نموذج للزلازل الأرضية تم اختيار اربعة توزيعات هو توزيع بيير والتوزيع العام للقيم المتطرفة وتوزيع اللوغاريتمي الطبيعي التوزيع الطبيعي وظهرت النتائج على التوالي ان توزيع بيير افضل نموذج ثم توزيع العام للقيم المتطرفة ثم توزيع اللوغاريتمي الطبيعي وبعده التوزيع الطبيعي . ولقد استخدمنا طريقة الامكان الاعظم في تقدير معلمات تلك التوزيعات . In this paper solar radiation was studied over the Iraqi countary land. The best sun duration hours regions (maximum hours) in Iraq were estimated detected by using Geographic information system (GIS Ver. 9.2) program to apply the (Inverse distance weighting) IDW exact interpolation technique depending on the measured data of metrological stations were distributed on the land areas of Iraq. The total area of the best regions was calculated .Excel 2007 program is used in calculation, graphics and comparison the results. في هذه الورقة تمت دراسة الإشعاع الشمسي الساقط على أرض بلد العراق. وقد تم تخمين والكشف عن أفضل المناطق سطوعا (أعلى عدد ساعات) في العراق باستخدام برنامج نظم المعلومات الجغرافية (GIS الإصدار 9.2) بتطبيق تقنية IDW تقنية الاستيفاء المحدد اعتمادا على البيانات المقاسة من محطات الانواء الجوية الموزعة على مناطق عديدة من أرض العراق . تم حساب مجموع أفضل تلك المناطق .تم استخدام برنامج Excel 2007 في الحسابات ، والرسومات ومقارنة النتائج. Currently voting process is paper based form, by using voting card or paper; thus the counting method is done manually, which exhausts a lot of time. Obsolete votes may be possibly occurring. This paper introduced a system in which voting and counting is done with the help of computer. The election process would be easier, it saves time, avoid errors while counting and obsolete votes are reduced. Electronic voting (E-voting) system is a voting system in which the election related data is stored and handled digitally, it would become the quickest, cheapest, and the most efficient way to administer election and count vote it is considered a means to further enhance and strengthen the democratic processes in modern information societies. The suggested a web based E-voting application using ASP.net with SQL server. This application implements a voting process within a voting station and gives the election results. نظام التصويت الالكتروني هو طريقه جديده للانتخاب في العالم ساعدت على تقليل الجهد المبذول في عمليات الانتخاب خاصه في الدول الكبرى وكذلك تقليل التكاليف الماديه المصروفه على مراكز الانتخاب،و عدد الاشخاص المراقبين لكل مركز انتخابي بالاضافة الى الاشخاص المسؤلين عن عمليات العد والفرز، هذا التطبيق يساعد الحكومات على تشكيل البيانات االتي يتم خزنها في برنامج التصويت الالكتروني مرجعا للدوله يمكن الاستفاده منه في مختلف مجالات الحياة. في هذا البحث وضحنا كيف يمكن ان تتم عمليه الانتخاب الالكتروني بشكل صحيح وكيف يمكن تطوير هذا النطام وجعله امن بشكل اكبر، وكذلك امكانية تطبيقه على جهاز يمكن للمفوضية العليا للانتخابات المستقله ان تعممه على مراكز الاقتراع لتسهيل عمليه الانتخاب على المفوضين وعلى الناخبين.